Technologies shown at CES are pushing 8K to PCs, but GPUs need to catch up. In 2020, 4K will be passe. The 2020 Tokyo Olympics will be broadcast in the 8K resolution, which is four times deeper than 4K. The 8K resolution—7680 x 4320 pixels—will make movies will look stunning, and gaming will be even better than on today’s PlayStation Pro or Xbox One S.
There’s a good chance you aren’t thinking of 8K yet because you haven’t even moved to 4K. The early 8K adopters will be gamers looking to buy the latest and greatest hardware, and creative professionals making 8K content. Content creation is as important as the hardware itself, and efforts to broadcast at 8K are underway. PCs are getting ready: Microsoft has said Windows 10 will support 8K. 8K is also important for virtual reality, where the visual experience matters. Better screens will improve VR graphics, though it takes a lot of processing power to render graphics at 8K. Chipmakers are preparing processors to take on 8K graphics. At CES this week, there were signs that 8K is slowly crawling into PCs, though mass adoption is years away. We’ve seen 8K TVs before, but the first 32-inch 8K monitor was shown at CES. Dell’s UltraSharp 32 Ultra HD showed stunning images like I’ve never seen on a screen before. It’ll ship in March starting at US$4,999. The Dell monitor has two DisplayPort 1.4 ports and four USB 3.0 ports. 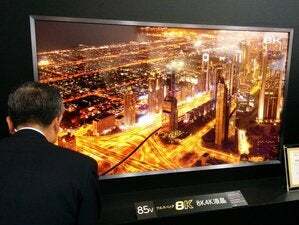 It has a video refresh rate of 60Hz, features 33.2 million pixels and shows more than a billion colors. But the demonstration was a bit awkward, partly because the PC or GPU wasn’t optimized for 8K. Images were taking a long time to draw up on the screen, partly because a graphics driver wasn’t available. That pointed to a larger problem—that PCs and GPUs aren’t ready for 8K yet. “When the next round of graphics cards refresh, they’ll get to the point where 8K is mass consumable,” said Michael Turner, product launch manager for displays at Dell. Nvidia and AMD are currently advertising their GPUs as 4K capable. But 8K could be on the roadmap starting with Nvidia’s Volta and AMD’s Vega, which are next-generation GPU architectures due for release this year. 8K is also expected to be hot in drones, which roam around the sky shooting video footage. Chipmaker Ambarella announced the low-power H3 chip for cameras that can shoot 8K H.264/AVC video at 30 frames per second. It is designed for 360-degree cameras used in drones and VR cameras. The chip has 10-bit HEVC High Dynamic Range (HDR) video processing capabilities and image stabilization features. The chip is based on an ARM 64-bit low-processor processor, allowing cameras to preserve battery life. The most popular ports to connect monitors in PCs are HDMI, which is popular in consumer PCs, and DisplayPort, which is used by professionals. Both of the standards are also moving to 8K. HDMI Forum announced the version 2.1 specification, which supports 8K at 60Hz. It’ll release the standard to adopters like display and PC makers in the second half of 2017. It’s cool for gaming: it has a feature called Game Mode VRR that reduces lag and stutter, much like Nvidia’s G-Sync and AMD’s FreeSync. But it’s not clear when it’ll start appearing in displays, TVs, and PCs. VESA is ahead of HDMI with DisplayPort 1.4 and HBR3, which are already getting support in displays like Dell’s UltraSharp 32 Ultra HD. It supports 8K at 60Hz and can also support HDR (high-dynamic range). It’s the only port available at this time for 8K. Another standard called SuperMHL emerged at last year’s CES, with goals to provide 8K connector ports at 120 frames per second. Last year, it was demonstrated on a TV from LG, and it also works with the versatile USB-C port. However, SuperMHL has since gone silent, but the MHL Consortium, which developed the standard, hopes to put the standard into TVs.